With the wedding happening in 11 days and how busy we are getting ready, you would think I’d be late on my 11 month posting, especially since I was late on the previous ones …. Who knows how these things work – certainly not me! If you are reading this before May 5th (2014), check back after then – I am waiting till then to post a picture from our wedding here. Where to start …. I’m on my second dress for the wedding (wrote about this in previous posts). The first one was hand tailored but the material turned out to be way more “champagne” than ivory and from the weight I lost, was now too large. In the last post I mentioned the white holoku (Hawaiian) style dress I purchased instead. The problem with this dress is that I was still to ‘large’ …. So I’ve been eating less and eating right plus walking around the block at work 2 to 4 times each night (we are on a mountain – a block here is has an elevation gain/loss of over 60 feet). I talked with my doctor about losing weight as well, since I will need to lose tonnage before surgery later this fall too. I told her about how losing weight had changed since HRT. A lot of ‘weight’ (fat actually …) has moved around as I went from a typical male distribution to female – but none went ‘away’ – ack. There are the obvious ones: stomach went down to the buttocks and up to the breasts, arm muscle mass reduced (not by much – they had me lifting heavy systems at work – side note here: I was helping one of the guys here lift an extremely heavy (probably over 300 #) disk array unit back into the rack. He got very red in the face and almost could not make it. At one point I was holding the majority of the weight as he tried to get a better position. The next day I find out he blew out his knee and pulled an arm muscle doing that. For me, it was heavy, but do’able. I don’t exactly want to be known for this and I think the guys are a bit embarrassed …. There was also a weight shift I didn’t expect: stomach ‘plumpness’ moved up! Below the belly-button I’m fairly flat now – it has moved up to just above the belly-button to just below the rib cage. And of course in losing weight, this is the ‘last’ place that seems to go away. Everything else loses weight first – like my breasts – grrrrrrr. So after all these months getting to an ‘ok’ size, now they are shrinking -ack. My doctor said: “welcome to womanhood”! The other big news is that not only have I decided on a date for my GRS surgery but the clinic has accepted me. I will be having my surgery in mid September with Dr. Suporn in Thailand. It has taken me a long time and a lot of research to come to this point. I wrote an entire post just on how I chose him (Choosing a Surgeon). Summarizing my transition at 11 months: other than weight moving around and losing bust-line, everything is ‘normal’ – exactly what and how I want to feel – normal – but as a woman! I had described this in a previous post (Ah – ‘Nothing’ at last …). My partner noted a couple other changes recently as well. She says my face has changed yet again – more feminine. Also my waist is coming in giving me more of the appearance of curves. At this point in my transition, my ideas surrounding being ‘passable’ are changing. I’m along the lines of “that is their assumption – no biggie”. This turned out to be a much larger topic than I thought, so I cut this out and created yet another post (On Being Passable). 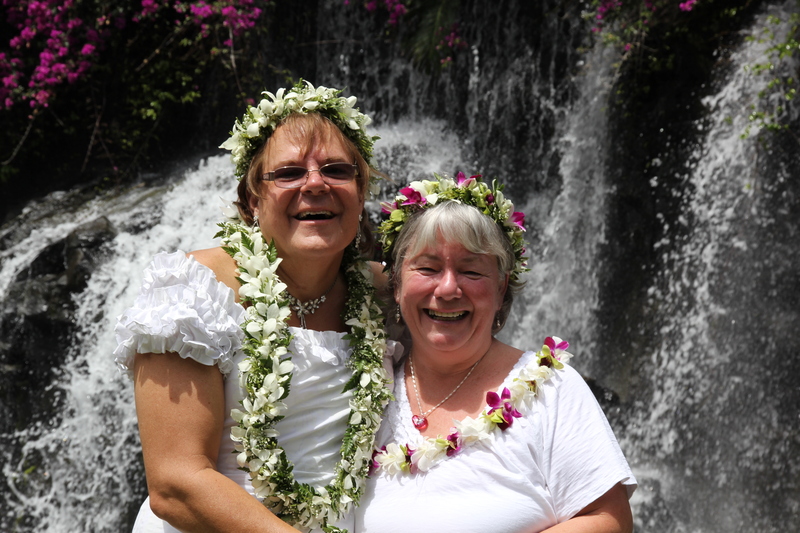 Well, now to go back to dreaming of my wedding, the gown, the flowers and leis, the beach and most of all, my Kealoha (beloved) …. Posted in Diary and tagged Being Female, Gender Change, Hormones, hrt, MTF, Transgender, Transition, Transition summary, Transsexual. Bookmark the permalink.